The University of Aberdeen is today at the forefront of teaching, learning and discovery, as it has been for 500 years. Founded in 1495, as Scotland's third oldest university and the fifth oldest in the UK. Currently placed 129th in the THE QS World University Rankings.Capital expenditure 1999-2009 totalled 229 million pounds, with a further 167 million pounds to be invested in infrastructure to 2019. Annual turnover in excess of 200 million pounds per annum.Five Nobel Laureates are associated with the University of Aberdeen. Student community representing 120 nationalities. 16,000 students: 46% men 54% women, and 19% mature undergraduates.High quality teaching - with over 89% subjects rated Excellent / Highly Satisfactory.Over 600 first degree programmes and more than 140 taught Masters programmes. Study abroad opportunities worldwide. 97% graduates enter directly into work, further study or training within 6 months .Teaching organised in three colleges: College of Life Sciences & Medicine, College of Physical Sciences, and College of Arts and Social Sciences .Over 3,000 staff - of whom 1,400 are academic. Research income trebled in the last decade .Aberdeen physicists and clinicians were first in the world to scan a patient's body using MRI. Strong track record in commercialising research - with over 400 patents pending and 21 spin-off companies. Wireless access across the whole campus, and strategy to continually improve student accommodation and facilities .Libraries with over a million volumes, priceless historic material, and seven museum collections recognised as nationally important .Over 150 sports clubs and societies, and the Olympic-standard Aberdeen Sports Village which opened summer 2009 .Home to high-profile culture events including the annual literary WORD Festival, Director's Cut, and the international Aberdeen Music Prize. The University of Aberdeen lies close to the heart of a city which is at the centre of a diverse and thriving regional economy. Aberdeen's pivotal role in the international oil and gas industry means that it enjoys excellent communications and travel links. The University of Aberdeen is very pleased to offer a 20% discount in postgraduate tuition fees for all alumni who have graduated with a degree from the University of Aberdeen. The Alumni Discount Scheme applies to both home and overseas students. In the absence of a local British Council office, consult the nearest British Embassy or High Commission. It may also be useful to visit the Education UK Scotland website and the UK Council for International Student Affairs. 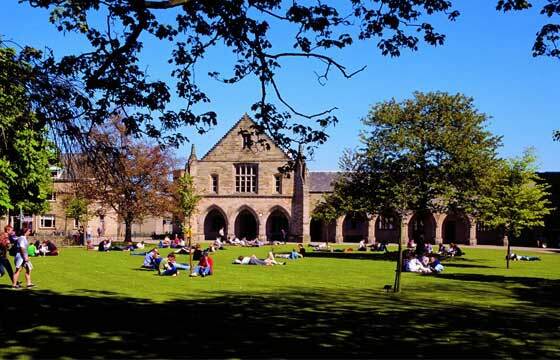 The University of Aberdeen offers scholarships and bursaries within a number of areas. Further opportunities can be found on the college websites of Arts and Social Sciences, Life Sciences and Medicine and Physical Sciences.